Film produced and directed by Bernard Josse; interviews and photographs by Gérard Rouy. Released on DVD August 2011. 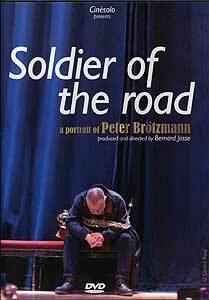 Text from DVD box: "How do you become Peter Brötzmann? How do you become what you are: a painter, a musician, an absolute artist? Europe was nothing but a ruin and shame possessed the heart of the young Germans. They needed to invent, scream, regain a lost brotherhood. Overcome this silence ! That's how some young German, British, Dutch, Belgian... musicians made Europe exist long before Maastrich and have kept on cherishing, imperturbably, their freedom! They are no longer twenty-year-olds, but others have followed. They set themselves one constraint: reinvent everything every time. ÊA way to take the very instant into account, to let the unexpected in, to match to the world." One hour of bonus with complementary interviews of Jost Gebers, Evan Parker, Fred Van Hove, Han Bennink, Peter Brötzmann, Michael Wertmüller. + extracts of Sonore (Mats Gustafsson, Peter Brötzmann, Ken Vandermark) in Wuppertal 2008, Chicago Tentet (Peter Brötzmann, Ken Vandermark, Pall Nilsen-Love, Michael Zerang, Kent Kessler, Joe McPhee, Fred Lonberg-Holm, Johannes Bauer, Connie Bauer, Jeb Bishop), in Amsterdam 2009, The damage is done (Michael Zerang, Peter Brötzmann, Kent Kessler, Joe McPhee) in Montreuil, 2009, Fred Van Hove solo in Anvers 2009.